Connect to an exciting Berlin experience where major shopping, dining, entertainment and landmarks are just minutes away. 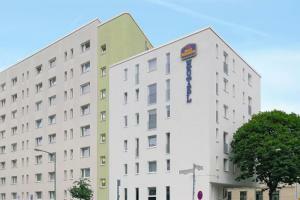 Best Western Hotel am Spittelmarkt is situated right by the rapid transit railway and near the underground stop to Alexanderplatz public square and Berlin Zoological Garden hubs. Immerse yourself in the culture of famous Friedrichstrasse, just a short walk from the hotel. After a day of sightseeing, return to the hotel's tranquil surrounds and retire to your comfortable guest room offering 24-hour room service, free Wi-Fi and satellite or cable TV. Start your day with a hearty buffet breakfast before heading out to another day of Berlin adventure and discovery. 8 miles from the Berlin Tegel Airport, near Friedrichstrasse. The Spittelmarkt underground station is less than a quarter of a mile away.